The court, while noting the CBI's submission that it was a case of high political corruption, said that it was unmoved by the nature of the case due to "nil evidence". 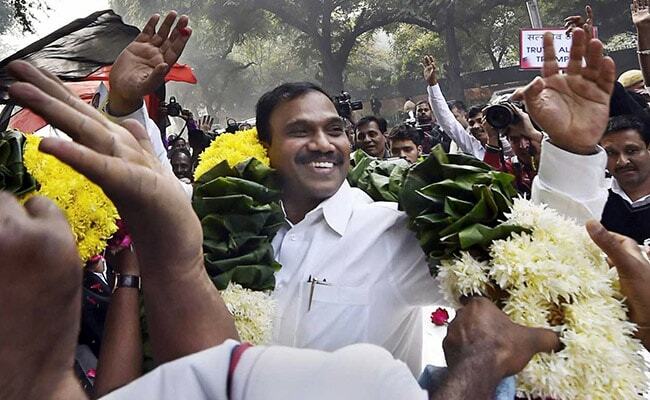 Former telecom minister A Raja, DMK MP Kanimozhi and others have been acquitted in the 2G case. New Delhi: The CBI's projection of the 2G spectrum allocation matter as a case of "high political corruption" did not impress the special court which held that high-profile nature of a case cannot be used as a ground for holding people guilty without legal evidence. Special CBI judge O P Saini, who acquitted former telecom minister A Raja, DMK MP Kanimozhi and others in the case, said the CBI cannot absolve itself of the burden to prove its case by "piggy riding on the so­called high magnitude" of the case and the media hype. "The trope of high magnitude of crime does not work at the final stage of the case. At the final stage, legally admissible evidence is required," the court said in its 1,552-page judgement. "However, in view of deficient, or I may say nil evidence on record, I find myself unimpressed and unmoved, whatever may be nature of the case," the judge said. "High profile nature of a case cannot be used as a ground for holding people guilty without legal evidence. Lack of commercial prudence in execution of documents cannot be used as a ruse to hold people guilty of corruption," the court said. It said that there could hardly be any direct evidence, oral or documentary, in the case of high political corruption but accused cannot be held guilty without legally admissible evidence. Besides Raja and Kanimozhi, the court also acquitted 15 other accused, including three companies. The other accused allowed to walk free include -- former telecom secretary Siddharth Behura, Raja's erstwhile private secretary R K Chandolia, Swan Telecom promoters Shahid Usman Balwa and Vinod Goenka, Unitech Ltd MD Sanjay Chandra and three top executives of Reliance Anil Dhirubhai Ambani Group -- Gautam Doshi, Surendra Pipara and Hari Nair. Directors of Kusegaon Fruits and Vegetables Pvt Ltd Asif Balwa and Rajiv Agarwal, Kalaignar TV director Sharad Kumar and Bollywood producer Karim Morani were also acquitted in the case along with three firms -- Swan Telecom Pvt Ltd, Reliance Telecom Ltd and Unitech Wireless (Tamil Nadu) Ltd. The CBI had alleged in its charge sheet that there was a loss of Rs 30,984 crore to the exchequer in allocation of licences for the 2G spectrum which were scrapped by the top court on February 2, 2012.